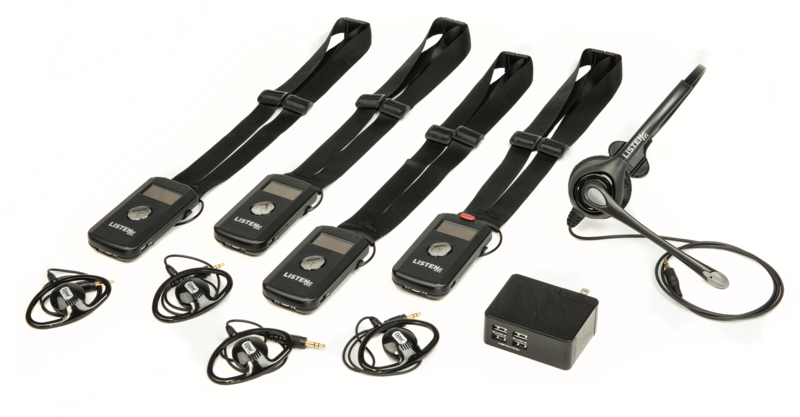 An ideal starter system for incorporating two-way communications, the LKS-1 ListenTALK System from Listen Technologies comes with everything you need. Each system includes four (4) ListenTALK Transceivers (with Leader Clips), one (1) Headset-2, and one (1) 4-Port USB Charger, all designed to enable convenient communication between one leader and up to three additional team members at a time. The LKS-1 is expandable to meet the growing needs of your venue, and more transceivers can be added at any time. The LKS-1 ListenTALK Base-4 System is specified.